He is 80, is battling throat cancer and can barely talk, is confined to a wheelchair because of an accident, has undergone a triple bypass surgery and has a heart that functions only up to 18% of its capacity. Where would you expect such a man to be? Confined to a hospital bed, of course. Dr Dicksheet met with an accident in 1978, which rendered his right side paralysed. He subsequently underwent a triple bypass surgery after suffering a severe heart attack. A Padma Shri awardee, Dr Dicksheet lives in New York for six months and spends the rest of the time in India, from September to March, travelling across 10 states solely to perform surgeries for cleft lips, squint eyes, facial scars, ptosis and birthmark removal. Each year, he travels through Maharashtra, Tamil Nadu, Gujarat, Chattisgarh, Madhya Pradesh, Delhi, Uttar Pradesh, Karnataka and Rajasthan to perform the surgeries. “My troubles are nothing when compared to the problems of children who come in for surgeries and the stigma they face in life because of their disfigurement. My sole aim in life is to give them a better life,” said Dr Dicksheet. This entry was posted in Uncategorized and tagged Bharatiya Jain Sangathan, doctor, Dr Dicksheet, Dr Sharad Kumar Dicksheet, medical miracle, Padma Shri, surgeries for cleft lips. Bookmark the permalink. 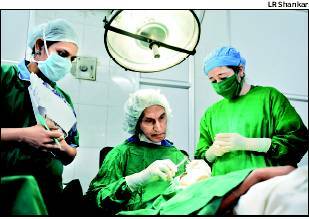 13 Responses to Eighty year old ailing doctor does 150 surgeries a day free of cost. Wow, really inspiring. Wish more doctors were like that. Although, in my life, I have seen several doctors who were selfless. But it takes real courage to forget one’s pain to cure others. Great to know. Thanks a million for your documentary which highlights this inspiring person. What a wonderful way to give back and share your gift with the world!! Smile Train is another organization that performs cleft Lip and Palette surgeries on children in 78 of the worlds poorest countries…I believe they perform aprox 300 daily.! Thank you Thank you to all the amazing doctors in this world who chose their profession because you truly care..you make the world a better place…these surgeries can be performed for only $250…what a small donation to change a life forever. Great Work, Truly Inspiring, All The Best. Hey Everyone! You many not have the talent to perform surgeries – but maybe you could give a few minutes of your time to SMILE TRAIN today. “Events in America” will be donating $10,000 to the charity with the highest percentage of votes, out of one million total…So far Smile Train has received 42%. Vote early. Vote often. Tell your friends and colleagues to visit this page and vote. Go to http://www.EventsInAmerica.com/vote-for-charity.html and click VOTE. Incredible doctor! that should be the spirit for one’s profession.this truly manifests that nothing can stop you from doing anything that brings smile to others faces provided you have the courage and determination for that cause.Selfless service is the best service and this is what this doctor is rendering for the poor and the deprived.I wish this great man should also visit Himachal Pradesh and benefit the needy people of this state.I pray to God for his longevity and request all the doctors to imbibe this spirit of selfless service. THIS IS REALLY AN UNCOMPARABLE SERVICE. HATS OFF TO DR. DHIKSITH. Really inspiring. He is the superstar. Despite his confrontation with his ailment,his contribution to the society in general and younger generation in particular,is really amazing and astonishing. Doctor Sir is one of the angels of GOD to the humanity.My prayers for the recovery from his ailment and setback and wishes for a long and healthy life.GOD bless him.